We are sure that you’ve found a slew of wonderful Halloween treats that you want to make, but where to find the time? So we’ve put together a list of Semi-Homemade Halloween treats that are great for sending to school or work, having for the kids when they get back from Trick-or-Treating, or even to serve at a party. Semi-homemade is a great way to have personalized treats without spending hours in the kitchen. These are one of our most favorite semi-homemade halloween treats. 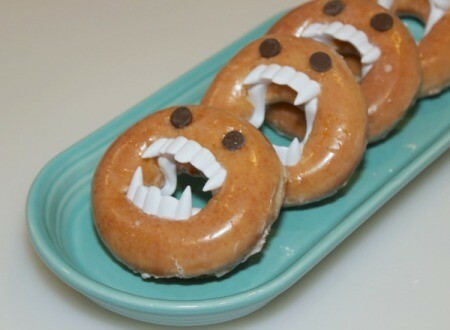 You just need your favorite donuts, some plastic vampire teeth, and some chocolate chips and you can create some super fun treats. I love the idea of doing this and then putting them back in the box. Imagine your co-workers surprise when they open a seemingly harmless box of donuts and find these creatures staring back at them. In case you haven’t noticed we are fans over handheld sweets around here. 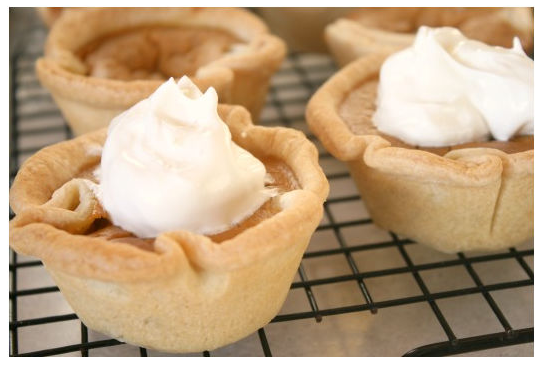 And these mini pumpkin pies are just too cute to eat! Almost. All you need is pumpkin pie filling, pre-made pie crust, and some whipped cream and you are good to go. These are cute, use all store bought items, and take no time at all! Plus they have candy corns on them. Anything with candy corn are a win in our book. Our friend over at Meghan on the Move has a great recipe for Semi-Homemade Hostess Cupcakes. She starts with chocolate cupcakes (made from a box cake mix), fills them with a yummy filling, and tops them with chocolate ganache and the famous hostess swirls. Did you know that the actual Hostess cupcakes have 7 swirls on the top? Do you know how hard it is to get SEVEN swirls on the top of a cupcake? Its darn near impossible! Regardless of the number of swirls on the top of your cupcakes, these are bound to impress your Halloween guests. We hope that this gives you a little bit of inspiration for having a sweet Halloween! What is your favorite semi-homemade Halloween treat?